Santri is a term used to refer to someone who studies Islamic religious education in islamic boarding schools which called as "Pesantren". Santri usually stay in islamic boarding school until their education is finished, usually six years or more. According to the language, the term santri comes from Sanskrit, "shastri" which has the same root word as the "literary" or "literate people" word which means scripture, religion and knowledge. A santri serving in a pesantren, by pesantren caregivers called "Kyai", is rewarded in the form of knowledge about Islam, starting from the elementary, middle and high levels. According to Indonesian Dictionary, santri are people who study Islam; people who worship earnestly; godly people. 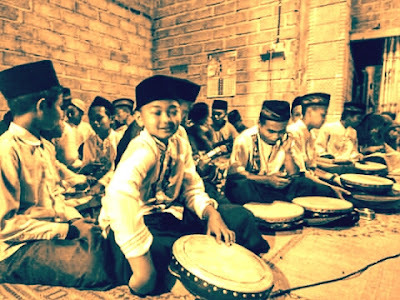 Santri is a student of a kiai who is educated with compassion to be a strong faith to Islam (who does not falter in faith by association, interests, and differences). Santri is a group that loves their country, while respecting their teachers and parents even though both of their parents are die. Santri are people who love their homeland (where they are born, breathe, and prostrate on it) and respect to their tradition and culture. Who respect to teachers and parents even though both of them are die. Santri is a group of people who have affection for fellow human beings and are very grateful. Santri is a person who loves fellow servants of God; who love science and knowledge and never stop to learn; Who regards religion as a gift and as a medium to get the pleasure of God. Santri is a grateful servant. A researcher named Johns said that the word santri came from Tamil language and had the meaning of the teacher reciting. While a researcher named CC. Berg said that the word santri came from Indian "Shastri" which means an expert on Hindu scriptures. This opinion is also supported by A. Steenbrink who consider that education in Islamic boarding schools is similar to Indian Hindu education. Some Indonesian people said that the word santri came from Javanese language "Cantrik" which mean someone who always loyal to follow his teacher and participate wherever the teacher go. The opinion that says "Santri" comes from the word "sastri", a Sanskrit word which means literacy. This opinion, according to Nurcholish Madjid, is based on a literary class of santri for Javanese who try to study Islamic religion through Arabic books. Opinion that said the term santri actually came from Javanese, from the word "cantrik" means someone who always follows a teacher where the teacher goes and settles.